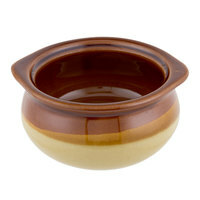 Serve up your famous french onion soup in this attractive Acopa onion soup china crock/bowl. Designed to enhance the presentation of your most in-demand comfort foods, this soup crock is perfect for everything from hearty soups to creamy mac and cheese! With its two-tone coloring, it offers classic warmth and a rustic feel that will make guests feel right at home. 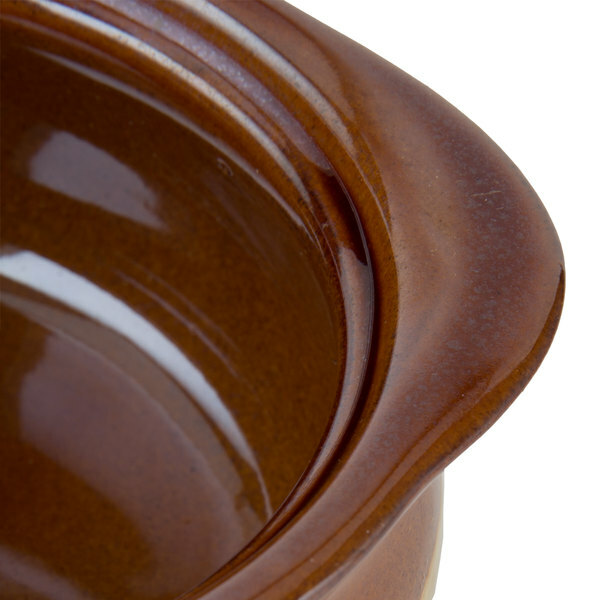 "These are pefect for our soup and our customers love getting their French onion soup in these classic crocks. They have held up well also." 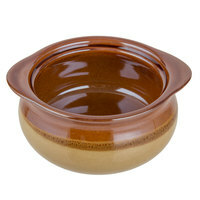 It features a rustic, earthy two-tone finish of caramel and ivory to match the warmth of your most popular comfort foods. You can serve it all, from traditional onion soups to baked beans and macaroni & cheese, and the 10 oz. 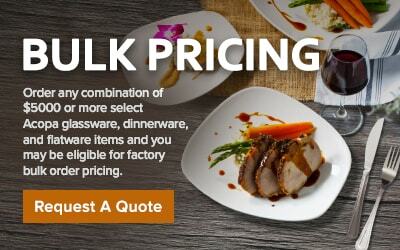 capacity is sure to satisfy even your hungriest customers. Made of durable yet elegant china, this crock is microwave and oven safe for easy baking and warming. It's also dishwasher safe to save you time on cleanup! This is where I get to review Customer Service. I did have a small problem with these, but I contacted Customer Service and they took care of me. I was both pleased and surprised at the same time. Now for the bowls - First, they are quite smaller than I expected them to be, but they are as described, so I can't fault the bowl for that. I am looking forward to using them for French Onion Soup, I just may have to plan on two bowls per person! 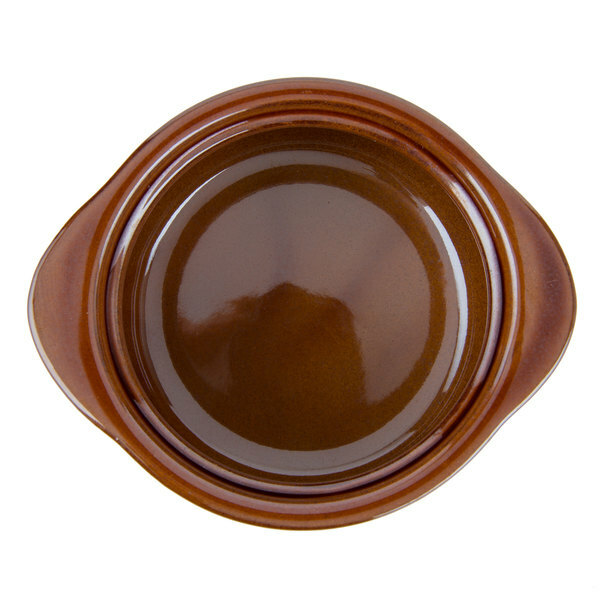 The quality is good, the appearance of the bowls is awesome. I wish they were bigger, but they will definitely be used! Great for the classic French Onion Soup look you grew up with in diners and such. Multiple times under high heat and no signs of cracking or distress. Clean easily. Outside pattern maintains well; no peeling. Wonderful soup crocks. These are something my wife wanted for just about all soups, and have made wonderful presentations in our home. They are easily chipped though, so be careful. A great product and price however many were broken in transit. Webstaurant was great about replacing however perhaps they should be packed better before shipping out. 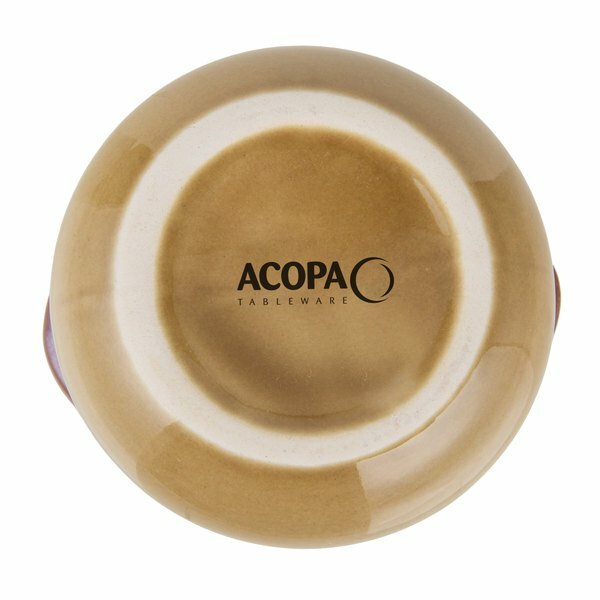 These Acopa Two Tone 10 oz. Onion Soup China Crock / Bowl are surprisingly well made for the price. I had my doubts but very pleasantly surprised with the quality. these are lightweight yet sturdy. we received our original shipment and 4 of the 6 were broken, i contacted customer service and within 3 days we received a new set of 6 which were in perfect condition. we use these mostly for chili and french onion. they are a great size and the lip/handles give it a welcoming feel. The size of this crock is just right for french onion soup. High quality, great look. This item ships free with Plus, so that is an added benefit! Perfect size for French Onion Soup and the guest love it. We have even told guest where to purchase these from. Sending more business your way! Keep up the Good Work! Two Tone 10 oz. Onion Soup China Crock / Bowl - 6/Pack they're small, I wouldn't say soup bowl size, more like salsa size but they're still beautiful and cutely sized. These are great LITTLE bowls- little being the key word. I choose a larger size from the site, not realizing how small it still is. It's about half the size of a standard french onion soup bowl. These are great little soup cups. We use them for soups other than french onion and people love the look of them. A few came broken in my package, but Webstaurant was quick to give me store credit. Would buy these again! Been looking for proper onion soup crocks for ages -- cant beat the price on these. Super sturdy, good from oven to table and the perfect mouth size to get that cheese layer that onion soup is famous for. 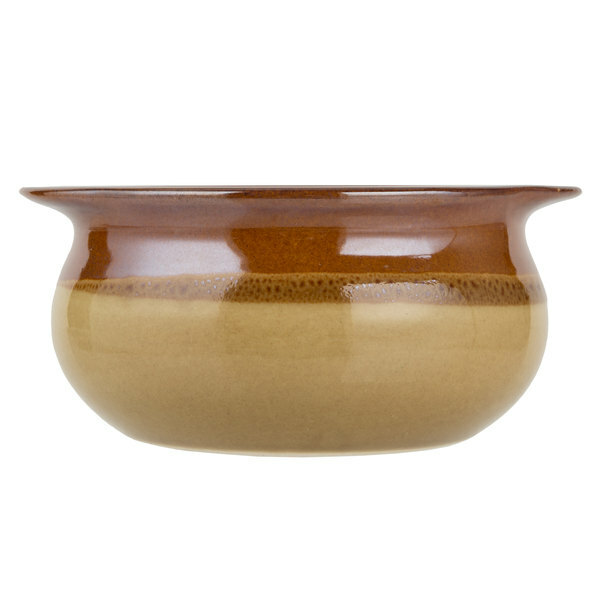 We use these bowls to make our Apple Crisp in, and they are just wonderful. They distribute and maintain heat very well, look great, and don't easily chip or break. 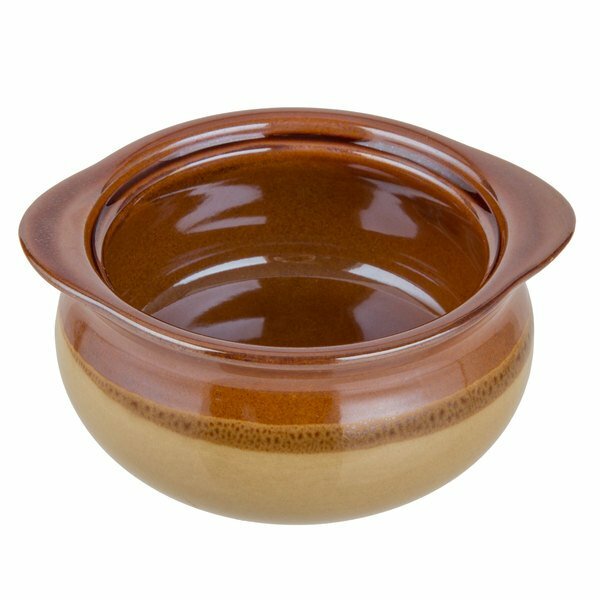 These bowls worked out great for oatmeal and other foods like ice cream ;) Made of durable material. The price is unbeatable! I even use them to serve salsas. These bowls were exactly what we were looking for. They are the perfect size for any type of soup you may be having. They were delivered quickly, actually faster than expected. I will search this website next time I need anything for the kitchen. This item came as described and it works great. Found it here for way less than anywhere else. Item was shipped quickly and would buy from here again. Classic French Onion soup bowl. Would love to see this style/color with a handle for ease of carrying. Colors look great and give the soup a more rustic and home cooked feel (as opposed to white). 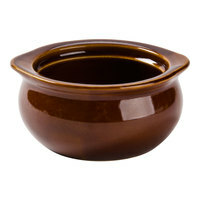 These are pefect for our soup and our customers love getting their French onion soup in these classic crocks. They have held up well also. Very pleased. Packing was excellent and the order was received quickly and was exactly as described. Will recommend to friends and family and plan to purchase other items. 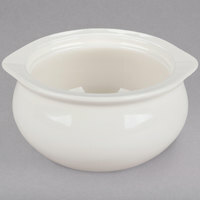 The French Onion Soup Crocks from Webstaurant are perfect for our French Onion Soup. They go under the broiler to melt the cheese and they keep the soup warm a long time.